Hillswick Public Hall sits between the A970 and the Ura Firth. It was built in the 1930s, replacing an older hall which had been a surplus Air Force pre-fab hut, bought and assembled by the community in 1921. According to a poem published in Feburary that year in the Shetland Times, the hall had become a necessity since the school authorities had started to take a dim view of the dances held in their premises. The new hall, which “holds a throng/ Who care for naught but dance and song”, was a demonstration of how “Without a doubt, in different ways/ We’re gayer than in pre-war days”. By then, the nearby St Magnus hotel had already been attracting tourists from all over the UK for twenty years, with the promise of loch and sea fishing, scenic cycling routes and cliff walks. The hotel, established by a steam-boat company, was only open in the summer, so something was needed to pass the winter evenings. The old hall sat on a gentle slope, on its own, between the two villages it served till it was replaced by the new, purpose-built structure. On a Saturday afternoon in 2017, the water shimmers beyond the cliffs and three furry pigs graze on somebody’s lawn across the road. A couple of cars are parked outside the hall, and Graeme Howell is leaning on the access ramp bannisters, enjoying the fine summer evening. Graeme moved up from England in 2015 to take up his job as general manager of Shetland Arts, the organisation that runs the Mareel arts centre in Lerwick, which is also the base for ScreenPlay Film Festival. Engine room of the North Star cinema, built long before Lerwick had public electricity. Many more images of the cinema and its advertising slides can be found in the Shetland Museum and Archives website. When it opened in 2012, Mareel became the first permanent cinema venue in Shetland since the closure of the North Star, which had operated since 1913 and became a (much remembered) nightclub in the 1990s. ScreenPlay has been going for 11 years and it offers an appealing mix of international features and a platform for local filmmakers (the programme this year includes a film about the North Star cinema!). The strength of the festival is in part rooted in a longer lineage of volunteer film exhibition and community filmmaking, but also in external connections to industry professionals like Mark Kermode. There is perhaps something characteristic in this modern port town’s appreciation of the homemade and the foreign, oil rigs and knitting. 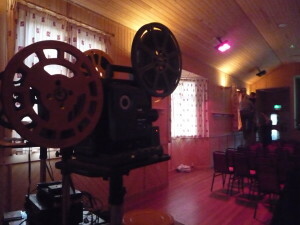 Inside the hall, a volunteer team are setting up two 16mm machines and a video projector for backup. Liam, a young technician from Mareel, hopes he can remember the instructions and timings for the changeovers, as the film does not have cue marks. He has been learning the craft of analogue projection from Stuart Hubbard, who with Kathy Hubbard – also of Shetland Arts – have been doing community screenings as the Shetland Film Club since 1990. The Club is less active now that there is again a permanent cinema in Lerwick, but they collaborate with Shetland Arts to take screenings to village halls in other parts of the archipelago. The portable screen, now flanked by a Shetland Arts banner on the Hillswick Hall stage, is often packed in the back of Stuart’s car, but it has been a long time since the 16mm projectors were used. The Hall was completely refurbished in 2012. The casket-like shape of the auditorium is fully encased in light-coloured wood, which calls to mind the Nordic intimacy of a sauna. On the shore side there is a function room with a bar and large picture windows framing views of the Ness of Olnesfirth across the water. The other room is a big catering kitchen, where members of the Hall Committee are slicing homemade fruit cake and setting out the tea service for the post-film discussion. The Buena Vista Social Club album plays quietly, incongruently in the background, and is later replaced by Scottish traditional tunes. It is a well-used hall, hosting various clubs through the week, Sunday teas in the summer, and music sessions that nurture local talent. Films are a less frequent occurrence. They were more regular 70 years ago, when the Highlands and Islands Film Guild was formed to provide cinema entertainment across this vast area. The screening at Hillswick is part of the Major Minor Cinema project, which brings together researchers from Stirling and Glasgow universities to explore the history of the Guild and its audiences. The project builds on Ian Goode’s previous work on the topic, during which he received letters from people who remembered going to the film shows organised by the Guild’s travelling operators, or later on by trained local volunteers, in village halls around the region. Embracing cinema memory as a form of enquiry in its own right, rather than a straightforward data source, the current project is nurturing creative writing that takes these non-theatrical cinema experiences as a possible subject. Cinema memory is a thriving research area, in the overlap between memory studies and historical spectatorship/audience studies. Scholars in this field reference Jackie Stacey and Annette Kuhn, whose pioneering works continue to influence methodology and to generate research questions. A special issue of the journal Memory Studies [unfortunately paywalled, except for the introduction] published in January 2017 includes accounts of ongoing research projects using oral histories in South Africa, Texas, the Czech Republic, Italy, and the UK, making the case for the specific contribution that cinema-focused memory studies can make to the broader field. The heightened sensory and affective stimulus of film, and the social aspects of cinemagoing, can conspire to make cinemagoing a memorable experience, which then serves as an anchor for other personal or cultural memories. The resulting interviews, letters, or narratives are very rich texts, open to re-interpretation as they recede into the past. Reframing the autobiographical as explicitly ‘creative’, in the way that the Major Minor Cinema project is doing, adds another layer of complexity to any presumed evidentiary reading of these memories. It places subjective experience at the centre and postpones the moment of academic interpretation, allowing the owner of the memory to process it and express it in their own way. In order to support this process, the Major Minor Cinema project have arranged creative writing workshops and pop-up screenings. Both are liable to awaken a more experiential connection to cinema memories, and to do memory work through these intuitive responses. The screening at Hillswick Hall was one such event, showing a programme of cartoon, newsreel and feature (Scott of the Antarctic), all on 16mm, as would have been the case at a Film Guild screening. This partial restaging (no hard wooden forms to sit on, nor the coldness of a damp hall in a winter night) was possible because the hall still exists and is still a public hall; because the Film Club still has and can operate 16mm projectors; because it is possible to buy old films on eBay; because there is a film festival supporting and advertising the event, but also a variety of local media from radio to noticeboards. The conditions of possibility of this re-enacted screening are radically different from those of its predecessor 70 years ago, but a mix of institutional support, individual initiative and community organising plays a part in both. Historical re-enactment is the bread and butter of immersive cinema. All sorts of exhibitors, from early cinema festivals to Secret Cinema extravaganzas, draw on the novelty or nostalgia of anachronistic exhibition practices. Organisations that work with dementia patients have noticed that cinema – not just the films, but also other approximations of classical cinemagoing – can have a mild therapeutic effect. Projects like BBC RemArc or the GFT’s Movie Memories are part of a much-needed effort to improve quality of life for people with dementia. Research conducted by Ana Salzberg (Dundee), Jenna Breckenridge (Edinburgh), Thilo Kroll (UC Dublin) and Gavin Wylie (Dundee) found that care home residents enjoyed a series of screenings of classic musicals, which triggered pleasurable memories of a favourite actor or a cinema date, and also provided a context in which to connect with others. The researchers emphasised that this wellbeing effect in the present is as important as any connection to the past that the films can provide. An engagement with cinema history, however, requires an approach to the past that goes beyond nostalgic and therapeutic uses of memory. It needs to be more open and unfinished than the former, and more dialectical than the latter. Last year, researchers at De Montfort University experimented with an immersive 1960s cinema screening as a means of communicating and sharing their research, and a connected project at UCL is also using re-enactment to disseminate results from a wide-ranging cinema memories project. In Shetland, the re-staging has a different purpose, as it takes place halfway through the project rather than at the end. The screening served as a public introduction to the community for the project’s researchers, as people were invited to keep an eye out for them and tell them their memories of the Guild, but it also demonstrated some of the existing knowledge of how a show would have been like. This is an exploratory sort of knowledge sharing, as people can respond to this reconstruction by validating, expanding, or challenging the story of the Film Guild that is being put forward. It also creates some minimum common ground for those of us who never went to a Guild screening. It was at this point that the experience of this re-enactment bifurcates, between those for whom it evokes memories and those for whom it is new information to take in. I had already spent the day in the archives piecing together a scattered understanding of cinema practices in the area. At the screening, instead, I tested the boundaries of my empathy by trying to imagine what it would have been like to go to a screening like this, here in Hillswick in the 1950s, and came up with nothing: I am not from there and then, I am not them. This failure of my own imagination makes the creative writing all the more important, as reading can be much more ‘immersive’ than any hyperrealistic simulation. Hear, for instance, Alison Miller read her short story commission for the project, an Orkney tale of teenage cinemagoing and furtive excitement set during World War II. Creative writing offers an elegant solution to the epistemological abyss of memory studies. It is a truth that does not claim primacy nor exclusivity; a way to tell the past that assumes there are multiple perspectives, but does not make a postmodern fuss. While I’m thinking this, on screen Captain Scott and his companions are freezing to death. The film is a re-telling of a classic tragedy from history, full of details that no-one can have known, crystallised as facts through its many versions. Jingoistic as it may be, the struggle against the elements is still compelling to watch, the music soars, and everybody sits tight. The reel changeovers are smooth and the picture is very steady, although the print is hopelessly faded to pink, and covered in dirt and scratches. It ends, the lights go up, and trays of cakes and biscuits are brought in from the kitchen. All over the room, conversation blossoms, and the fate of the Antarctic explorers becomes – if you forgive the pun – an ice breaker. Then there are cups to wash, equipment to pack, the screen to fold down, emails to be collected and festival brochures distributed. The next day the Hall hosts a fish auction. Special thanks to Sarah Neely, Ealasaid Munro, Ian Goode, and Nalini Paul for allowing me to join their research trip for a bit. Thanks also to Roseanne Watt, Ryan Sandison, Stuart and Kathy Hubbard for providing information and explaining things to me. Any errors are my own and I would be grateful for corrections or comments.